PF-Detect - The 1st Leak Detectable Chemical Dosing Hose | Dual Containment Hose System | Colex International Ltd.
Colex International and are proud to offer the very latest generation of dual containment hose - PF-Detect. The hose offers all the obvious advantages of ProtectaFlex with the added benefit of a leak detection system. If you want to know the minute your dosing system has any problems this is the hose for you. PF-Detect will sound an alarm, send a signal to switch off your dosing pump and give you the chance to get your reserve line working within seconds of a hose failure. The fear of aggressive chemicals getting out into the environment, due to undetected leaks, was the reason behind the development of dual containment Hose. With PF-Detect this fear can be almost eradicated! An exciting opportunity to put in the very latest system available. 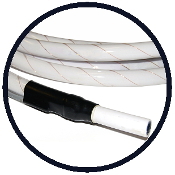 Hoses can be wired direct into the rig or SCADA for instant shut-off and alarm. Immediate visual & audible alarm once system triggered by either chemical leak or system cable failure (when used in conjunction with alarm box). Alarms not reliant on chemicals having to reach detection points or catch-pots. Due to minimal leak potential PF Detect can eliminate the need for mid-point catch-pots. Reduced risk of environmental exposure as chemical escape is minimized and contained. With no excess of chemical to clear up in outer containment hoses, clean-ups and replacement of hoses is quicker and safer. Lightweight & reduced size, hence lower carriage & packaging costs. Works with cost effective and readily available fitting. Each hose can be supplied circuit tested and certified prior to dispatch with point of application end assembled. Supplied with simple to use inlet end assembly kit containing shrink connectors & connecting cable and an outlet kit containing shrink connectors & resistor pack. Optional alarm box also available.1 alarm box will take up to 6 hoses.